Truth For Life Episode Reminder Get a sneak-peek into each new show, delivered straight to your inbox! Enjoy relevant and clear Bible teaching daily. 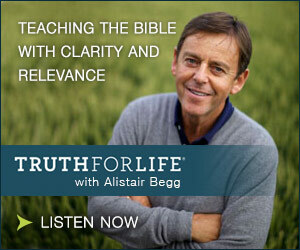 Alistair Begg has been in pastoral ministry for more than 30 years. Following graduation from The London School of Theology he served eight years in Scotland at both Charlotte Chapel in Edinburgh and Hamilton Baptist Church. For the last 22 years he has been the senior pastor at Parkside Church near Cleveland, Ohio. He has written several books and is heard daily and weekly on the radio program, Truth For Life. The teaching on Truth For Life stems from the week by week Bible teaching at Parkside Church. He was recently awarded an honorary doctorate from Cedarville University. He and his wife, Susan, have been married 30 years and have three grown children.